The latest addition to NAD's burgeoning range is the C355 stereo integrated amp, which is set to replace the well-liked C352. Although the amp is priced at just £400, it is said to benefit from a number of refinements taken from the brand's top-of-the-range Masters Series M3 dual mono integrated amplifier. The refinements include an application of NAD's Distortion Cancelling Circuit in the C355's output stage, plus a BEE Clamp in the power supply - two innovations by Bjorn Erik Edvardsen (the BEE bit) - NAD's director of Advanced Development. The newcomer also includes an improved tone control circuit and a PCB layout that's revised to reduce distortion and noise to unprecedented levels, according to a spokesperson. The amp is conservatively rated at 80 watts (continuous) which ramps up to 140 watts (into 8 ohms) of dynamic power when required. It also includes NAD's proprietary 'PowerDrive' circuit topology, which is said to allow maximum performance with difficult speaker loads by automatically sensing speaker impedance characteristics. 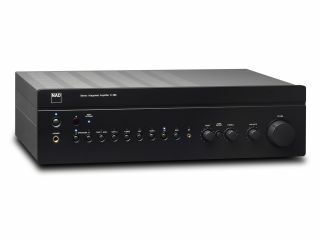 The amp comes supplied with NAD's SR 6 Full-System remote control, which can also operate many other NAD products, including its CD players, and tuners. It will be finished in a choice of either NAD graphite or titanium.